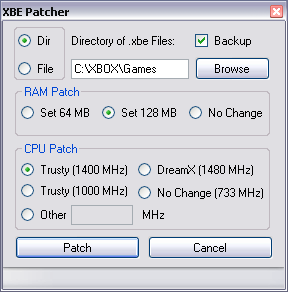 Discussion in 'Xbox (Original console)' started by weinerschnitzel, Feb 14, 2014.
mwaterbu made a new XBE patcher that takes alot of the stress away from patching individual .xbe's. I recommend anyone with any upgraded processor or RAM upgrade to check it out! ITT I would like to discuss this patcher, and anything it takes to patch edge-case games that require a special fix. This should include the tools needed to decompile and analyse an XBE, the sections relevant to patching, and actual hex edits themselves. Can you describe the GTA SA fix or any other game specific hex edits? I couldn't get any GTA working on my trusty. Half-Life 2 and Marvel Ultimate Alliance didn't work either. Maybe we can compile a list of broken games and eventually find a fix for all of them. The patch is pretty simple. I first made it based on the other patches which were out there that just found every instance of "733333333" in hex (2BB5C755h) and replaced it with "1400000000" or whatever the proper value was. It seems that since only one type of CPU would be used, the value was just hardcoded in to most games. I got this from IDA. Not sure if you have used it before, but it's a pretty neat tool. In school, I only learned Motorola 68k assembly, so this x86 isn't as familiar to me. 0B3095h is just 733333, the clock speed in KHz instead of just Hz. Replacing it with 155CC0h (1400000) fixes this game. I wish that was all that was needed to fix every game, but GTA is the only one I have figured out so far. I couldn't find 733333 used in the other games in this way. So not sure what it is going to take to fix the rest of the games, but a better understanding of how QueryPerformanceCounter is being used would help me for sure. I also wanted to make the patch a little more robust, and search not just for 733333333, since that could appear randomly (although unlikely). Instead I would want to include the opcode for QueryPerformanceFrequency as well. If I added the bit for 733333 into the patch, I would definitely want some extra data around it since this value is much smaller, and could more easily appear coincidentally. Hope this wasn't too long. Sorry for the late reply, I have been working 11 hour midnight shifts this past month, and don't have much time for anything lately. It would be awesome if you can provide assistance with this task! I would love to get every game working with this. I'm completely new to reverse engineering. We really need to come up with a list of broken games and eventually come up with a fix for all of them. I feel that if there is a pool of capable and interested people, it would be on this forum. I think that watching the XDK revision may give some hints to different patches. Help/Support/Advice/Ideas are all greatly appreciated. Looks great! I had no idea games had to be patched for upgraded systems though. How is QueryPerformanceCounter implemented? I'm not at home at the moment. Looks useful. I do know one game that is messed up and the older patcher for the DreamX 1480 doesn't seem to work on it for me. Shadow the Hedgehog. Game runs at double speed. I'd try it but I doubt if it will help me right now since it claims to only work on GTA. EDIT: Forgot to say what I have. Trusty mod 1.1 with 1.4GHz Tualatin and 128MB RAM. Thanks! I have 950 original games and just to patch them for 128 RAM was a 2 day mission! I am very thankful for this tool! I wish I had it before but now is good also! I also have both the 1GHz and the 1.4GHz so I never patched them all. This way I can scan lets say coinops and then redo it for the other size processor. Very cool! I will try it out tonight! Wouldn't an FTP tool and proper code-search make a lot more sense? I could imagine that just replacing 2BB5C755 could break a lot if it's found in a data section for example. It would probably be wise to monitor the hardware timing register access too (rdtsc). Myria: I believe they use the kernel? KeQueryPerformanceCounter (Ordinal 126) and KeQueryPerformanceFrequency (Ordinal 127). So one could probably easily create a trampoline function which wraps around these / or patch the kernel? I'm not sure about all of this CPU freq. modding though. But if you need to use a different kernel anyway then it would be the most logical step to fix the kernel. Personally I don't have any interest or time to do that though. And you see any improvement ? Some do improve. I think one of the Halo games will do a bit better in multiplayer with the 128MB patch. Also helps to have the 1.4GHz CPU too for when your console hosts the match with more than 8 players. More CPU power prevents lag during heavy moments. I've been trying to get GTA Vice City running properly on my 1GHz Xbox but even with all instances of 0B3095 (733333) manually patched and the other patch I still get faster than expected speeds in game, any idea which GTA the author was referring to when he patched or how he got the symbol names for the XBE in IDA? GTA SA was fixable if you patched the clockrate values in KHz instead of MHz. The other GTA's are less forgiving. I patched several values removing the last relevant numbers from "73333333" until I broke the game. Some parts of the game worked better with more patching. That tells me there are likely more values that effect gameplay speed. Searching for all suspicious occurrences relating remotely to the clockrate and then checking them in IDA should be the best way to come up with a custom patch. I'm curious about the relevance of code that does not get affected by using a CPU mod with a switch like DreamX or the new trusty board. Video playback in most games, (HL2 and other GTA's specifically) are still out of sync. Switch enabled or disabled. Those seem unbeatable to me through simple patches. Sorry to bump this, but I'm having the speed problem with both Splinter Cell Pandora Tomorrow and Chaos Theory, along with GTA San Andreas. When you say patch in kHz, what exactly does that involve? I know what the default hex value is and I'm testing San Andreas, but no matter what I change the value to, it still runs at the same speed. Is it a different value that needs changing in this game? I have a 1GHz Xbox with 128MB RAM, thanks. EDIT: It turns out Chaos Theory has sc3.xbe and sc3_adv.xbe, I just edited those to have the 1000000000Hz value and that seems to have solved the problem. Pandora Tomorrow has Offline.xbe that also needs the value changed to make the game work. As for San Andreas, I only noticed the first post had a quote which stated that it's usually in Hz, while that's kHz. I just got confused because I've seen that it's in kHz instead of MHz, but it's usually a value in Hz.